The Ildo Nandja Trio will perform at The Jazzy Rainbow in Durban’s Morningside on July 7 as part of the Concerts SA Venue Circuit which aims to foster a love and support for live music in communities, as well as anchor small and medium sized venues in urban and rural Gauteng, KwaZulu-Natal, and the Western Cape. The trio comprises Ildo Nandja on upright bass and vocals, Neil Gonsalves on piano and Sibusiso Zondi on Drums. 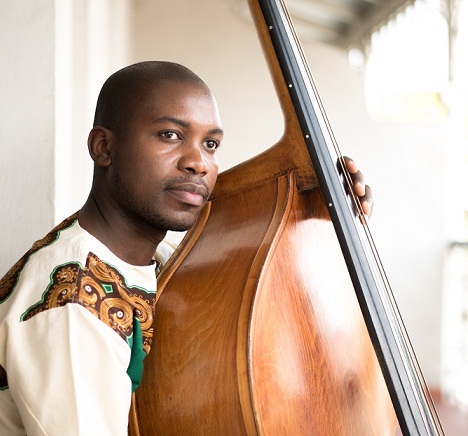 Ildo Nandja is a double bassist, composer and educator from Mozambique. Currently he is based in Durban where he has been studying and working. From a young age he engaged with playing music, starting with percussion instruments. Through his involvement in a local music and dance company, He began playing the timbala, a traditional xylophone. His dedication led him to perform at festivals and events across Africa and Europe. Now recognised as an outstanding and disciplined jazz musician, bass player and soloist, Nandja has collaborated with countless international and local musicians across Southern Africa and abroad. The audience should expect a concert that tells a story more like a painting. Nandja is exploring and trying new sounds allowing his band members to fully participate in the process. The result is a combination that produces and portrays his musical ideologies and experimentations. The Jazzy Rainbow, in association with Concerts SA, launched its first straight jazz programme on the eve of Heritage Day in September2016 and is following up with the same concept in 2017. “#JazzyStraightAhead is about introducing regular, live, straight jazz concerts to our city in order to help keep the music alive,” says Oliver-Rene Haas. The Ildo Nandja Trio will perform at The Jazzy Rainbow from 19h00 on July 7 (doors open at 19h00). Entrance R70 including a free drink (T&C). The Jazzy Rainbow is situated at 93 Smiso Nkwanyana Road (formerly Goble Road) in Morningside.